Ever wish you could stand out from the crowd a little more? Animal style contact lenses might be for you. They're great for Halloween, a night on the town, or even just for fun. People often think it must be weird seeing through special effects lenses, but the centers of animal contacts are clear and do not obstruct vision. They just look strange from the outside. Several different animal choices are available from different manufacturers, including cat, jaguar, and zebra from WildEyes, and dragon lenses from FXEyes. If you're a big spender (or have a movie-maker's budget), there are even companies that will you design your own custom lenses! 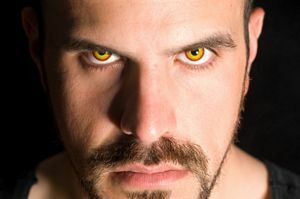 Animal contacts are available with or without prescriptive correction, so even if you don't usually wear glasses or contacts, you can look a little less human. However, even if you don't need the contacts for vision correction, you will need to see an eye care professional for a prescription. Contacts must be properly fitted to your eyes or they will be uncomfortable and could cause serious eye damage. Animal contact lenses, like any contacts, need to be cleaned regularly with special solution and stored properly. Usually they cannot be worn overnight, so you will need to take them out before bed. If you are new to wearing contacts, as your eye doctor for care instructions when you go for your lens fitting. While it might seem like fun to let friends try on your animal lenses, you should never share your contacts with anyone. Sharing can lead to serious eye infections. Always buy any contact lenses from an authorized dealer to ensure that you are getting a safe, FDA-approved product. While you may see sellers online or at flea markets who don't ask for a prescription, this type of sale is illegal in the United States, and you risk getting unsterile or poorly manufactured products. Corneal abrasions and eye infections can cause permanent vision loss, scarring, and blindness, so don't take chances! Never buy contact lenses from any seller who doesn't require a prescription. With special effects contacts gaining popularity, you may be able to purchase animal lenses from your eye doctor or a local optician. You can also order lenses online from an authorized dealer. If you are have trouble locating the lenses you want, try contacting the manufacturer. They can probably refer you to a dealer near you or an online retailer.